Isn't this such a pretty little example of sea life? These little anenomes were so small. They varied between the size of a dime to the size of a quarter. 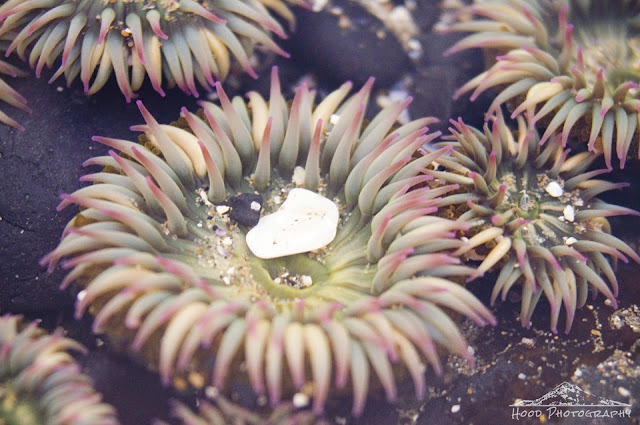 The range in colors in their tentacles was just so beautiful, I just could not resist kneeling down on to the damp rocks around the tidepools to get a macro photo of them. Wow, this is a great capture! Nice shot of this colorful sea life. I'd be down on my knees photographing this too! I would definitely be down on my knees to photograph this! Awesome! I've seen some that swim upside down!